For years, the principals of the Hank Williams estate (Hank Jr. and Jett) were warring back and forth, and this kept the treasure trove of Hank Williams’ legacy recordings relegated to bootlegs and listening parties for the select few with access to the Acuff/Rose archive. But the last couple of years have seen a dizzying dump of previously-unheard material from country’s first superstar, enough to make navigating and delineating between the various projects a little difficult. This week yet another new release of music was announced, called the Lost Concert Recordings set for release on October 2nd. The collection includes two live concerts, one from Niagara Falls, NY on April 25, 1952, and another from Sunset Park in West Grove, PA on July 13, 1952. The collection also includes the only known live recording of “Are You Walking and A Talking,” and a rare radio interview conducted on September 14, 1951 (see more details below). 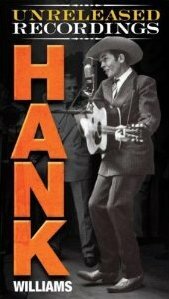 Some folks who may have been listening to the Hank’s Mother’s Best bootlegs for years may see these new box sets as pricey extravagances, but Time Life has done a remarkable job putting together collections to appeal to various people and that make great gifts filled with extensive liner notes and photos. Whether you have the inclination to purchase them or not, it is good to see Hank’s complete legacy now finally available for all the world to hear. 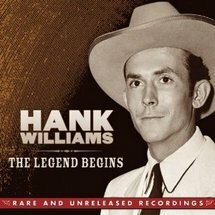 Here is a complete list of Hank Williams’ recent legacy recording releases. This was the first of the Hank Williams legacy recordings to be officially released by Time Life, and includes 54 songs that Hank recorded as part of a Mother’s Best Flour-sponsored show on WSM in Nashville weekday mornings during 1951. When Hank was out of town on tour, he would pre-record the shows on an acetate format. The acetate discs remained on the shelves of WSM for years until they were thrown away and a studious WSM studio worker rescued the recordings in a dumpster. After an 8-year court battle, the Williams estate finally gained ownership of the recordings. This first collection only includes a potion of the much-larger Mother’s Best collection, but also includes some of its choicest cuts. The Complete Mother’s Best recordings would be released later (see below). A bootleg of the Mother’s Bestrecordings was circulated for years before this official release. It is available on vinyl, as well as CD and MP3 format. 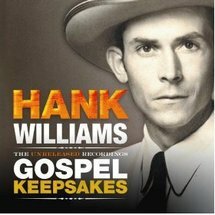 Another collection culled from The Mother’s Best Recordings, but is only one, 15-song CD showcasing the best gospel cuts from Hank’s weekday morning show. This is the second 54-song installment of the original Mother’s Best recordings, and like the first, comes with 3 discs and a 40-page booklet in the physical form, but this one is not available on vinyl. One of the highlights from this collection is it showcases Jerry Rivers and Hank’s Drifting Cowboy Band on multiple tracks. This box set has sold significantly less copies as the first Unreleased Recordings and wasn’t as heavily promoted, possibly because the cuts are deeper into the Mother’s Best sessions. 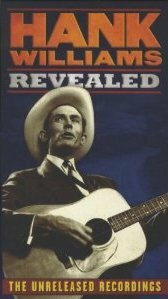 However for serious Hank Williams fans, Revealed holds just as many audio treasures. This is the mother load of the Hank Williams Mother’s Best recordings, all 365 tracks, 143 songs, on 15 discs and one DVD. 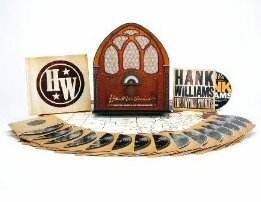 The collection comes in a collector’s “radio box” with an embedded sound chip, and includes a 108-page hardcover book with information and photos, an introduction by Hank Williams Jr. and an afterward by Jett Williams, and a poster that chronicles Hank’s 1951 touring schedule. The collection went on to be nominated for a Grammy. Another release by Time Life, but the first not to include recordings from the Mother’s Best acetate collection. 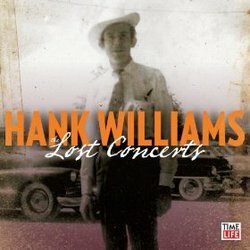 Instead this 3-disc set includes 8 15-minute recordings from his first real syndicated radio program, “The Health and Happiness Show” sponsored by Hadacol, 4 previously-unreleased recordings from 1940 that Jett Williams bought at an auction from a collector, and recordings from 1938 when then teenager Hank Williams recorded his first ever songs in the kitchen of DJ Uncle Bob Helton in Montgomery, AL. on acetate. This collection includes truly the earliest and most-rare Hank Williams recordings, including his first ever recorded song, a blues number called “Fan It”. This is the most controversial of Hank Williams’ legacy releases, and the only one not released by Time Life but rather Bob Dylan’s label. 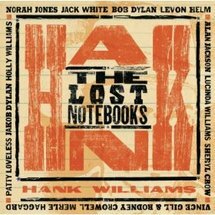 The Lost Notebooks takes unfinished song sheets from Hank found after his death and combines them with big names in music today to finish them like Jack White, Sheryl Crow, and Alan Jackson. In a story very similar to the acetate recording from Hank Mother’s Best collection, 17 songs from these “lost notebooks” were allegedly found thrown away by an employee at the offices of music publisher Sony ATV (previously Acuff/Rose). The employee then sold them to a collector and after an extended legal battle, Sony ATV re-acquired the lost songs. Allegedly as part of The Country Music’s Hall of Fame’s Williams Family exhibit, Bob Dylan was given the songs to finish them, though Saving Country Music discovered Dylan had been in discussion to finish the songs as early as 2004. Dylan finally decided to hand the songs out to various folks to finish. There continues to be questions surrounding The Lost Notebooks of Hank Williams project, but that hasn’t stopped it from becoming one of the best-selling of Hank’s recent legacy projects. This collection includes two live concerts, one from Niagara Falls, NY on April 25, 1952, and another from Sunset Park in West Grove, PA on July 13, 1952, and boasts the only known live recording of “Are You Walking and A Talking,” and a rare radio interview conducted on September 14, 1951. In between the songs, Hank shares personal anecdotes about himself, his band members and his songs. Another Time Life release that includes songs from the original Mother’s Best acetate recordings, the one disc Sacred Songs II features tracks that can be found on other Mother’s Best compilations, but focuses on the gospel selections that Hank loved to sing. 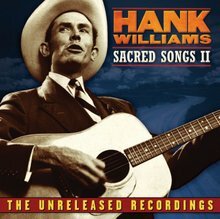 Sacred Songs II also includes the bonus of a complete radio show from 1951 finishing the album Hank Williams singing his hit Lovesick Blues among others. Just a heads up, the vinyl release of The Unreleased Recordings does not have all the tracks that the cd set has. It is just one 180gram vinyl “featuring the best of some of these shows”. if you don’t own any of these recordings, you should. I have the Complete Box Set thingie – it’s a nice item and reasonably priced if you shop around. But to be honest I’d have been quite happy with a flat box type affair like the Bear Family releases. A pretend radio is a bugger to store!! The Lost Concert Recordings is out and it’s fantastic.